Ken Read, North Sails President and Atlantic Cup Expert Previews the First Leg! So, now we are getting down to crunch time. As the fleet is very quickly approaching their noontime start on Saturday, you have to believe that the pace of the project and jobs for these short-handed crews is increasing by the minute in order to be 100% prepared to go offshore. Let’s just imagine what’s going through the minds of all these competitors as Leg one approaches. First of all, they’re going offshore in what could turn into a tricky coastal race or an offshore race. They are dealing with Cape Hatteras, one of the most dangerous places on earth. Sticking straight out into the middle of the ocean, it goes from dangerously shallow to extremely deep in a heartbeat. They are dealing with the Gulf Stream, which is tricky on a good day and is notorious for spinning off its own little mini-weather systems. They could be pushing for weather systems, they could be trying to fight for shoreline and local sea breezes, and they’re trying to do this in souped-up 40-foot racing machines, completely short-handed with only two crew… Now, this sounds like fun to me, I can tell you! For everyone following the race, you’re probably thinking that this is the craziest thing you’ve ever heard of. And that’s the beauty of this race; the fun is in the excitement. With that said, we at North Sails wish the fleet the best of luck, safe passage and we’ll see you all up in New York. For sure, I will be glued to the tracker, wishing I were onboard one of these race machines. 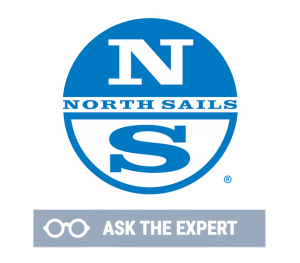 To ask the North Sails Experts a question about the Atlantic Cup, click HERE!